Episode two of Your Inner Fish, the three-part science series on PBS picks up right where the first episode left off. Host and narrator Neil Shubin (an evolutionary biologist) takes us on a journey that presents evidence for the transition from reptiles to mammals in the evolutionary process. About 375 million years ago, a fish-like creature crawled out of the water into land. From this creature evolved amphibians, reptiles, and mammals. A huge achievement in the search for evidence of this process was the discovery of the bones of a creature which was part-reptile and part-mammal. As Shubin puts it, this creature was in "the cusp of the transition from reptile to men." It was a key moment in the evolution of the human body. The modern human body carries features that it inherited from ancient reptilian ancestors. These features are in our skin, our hair, our teeth and in our reproductive process. The human teeth contains remnants of our reptilian ancestors. The hair we have is believed to have started developing after the Permian extinction millions of years ago wherein our ancestors had to burrow underground to escape the extreme environmental conditions caused by a catastrophe. Extensive research by scientists prove that the bones in our ears have evolved from the jaws of our reptilian ancestors. This transition can be observed in the development of the ears in opossums. The most interesting part of the episode concerns the fact that we humans have a yolk sac in our early development process. This can be seen in the first few weeks of conception (in an 8-week old fetus). This yolk sac gets smaller as the human embryo develops. 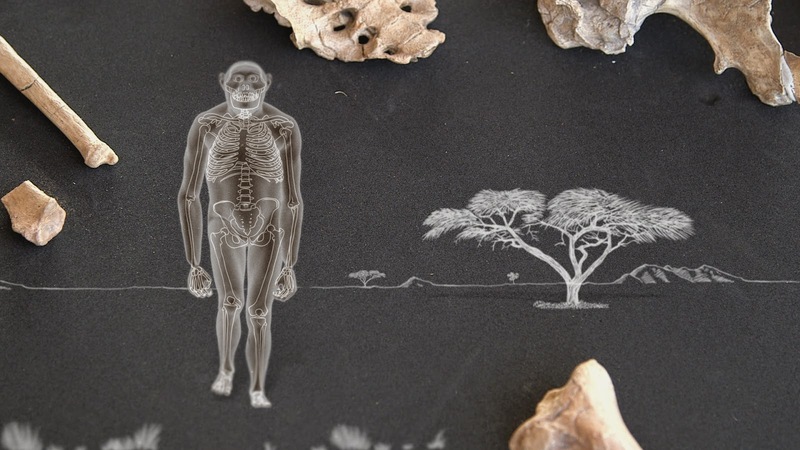 This sac is a window back in time that reveals our evolutionary history. Here's the interesting part: although the sac is there, it doesn't contain any yolk. It's because it's merely a remnant of our evolution. It's something from a time where our ancestors used to lay eggs. The amnion, the sac of fluid which cushions the human embryo, is also a gift from our reptilian ancestors. When our ancestors moved out of the water about 375 million years ago, they need to find a way to prevent their eggs from drying out in the new environment. Amphibians solved this problem by simply returning to the water to lay their eggs. Reptiles, on the other hand, came up with a more radical solution. They enclosed their embryos in a sac of fluid and covered them with protective shells. This enabled them to be able to lay their eggs on shore (away from the water). Humans have egg and yolk genes. The yolk sacs that human embryos have are evidence for this. But these have been rendered dysfunctional by the evolutionary process. Our DNA tells us that we have come from egg-laying animals. We carry the genetic signature of such ancestors.